I read this article and found it very interesting, thought it might be something for you. 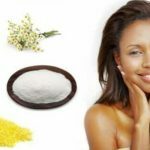 The article is called Face Scrub For Combination Skin and is located at https://homemademasks.net/homemade-face-scrubs/facial-scrub-with-cornmeal-powdered-milk-and-chamomile-tea/. This facial scrub containing chamomile it’s suited tp sensitive skin but you can also use this chamomile scrub for other types of skin like : normal, combination (between dry and sensitive) or dry skin. In case you did n`t know, chamomile tea can successfully treat a range of skin problems like: eczema, acne, can sooth skin rashes and it also helps with minor burns and sunburn. Chamomile flowers have – through the oils they contain – aromatherapy properties. The essential oils extracted from the chamomile flowers are not only great for health related matters (as it can be used both internally and externally) but also for cosmetics, dietary supplements, aromatherapy etc. Prepare some chamomile tea and let it cool. Put it in a bowl and add the cornmeal and the milk powder. Mix them really well and gently apply the mixture all over your face. You can prepare this scrub once a week to clean your skin. Don’t forget to intensively hydrate your skin after your facial scrub.